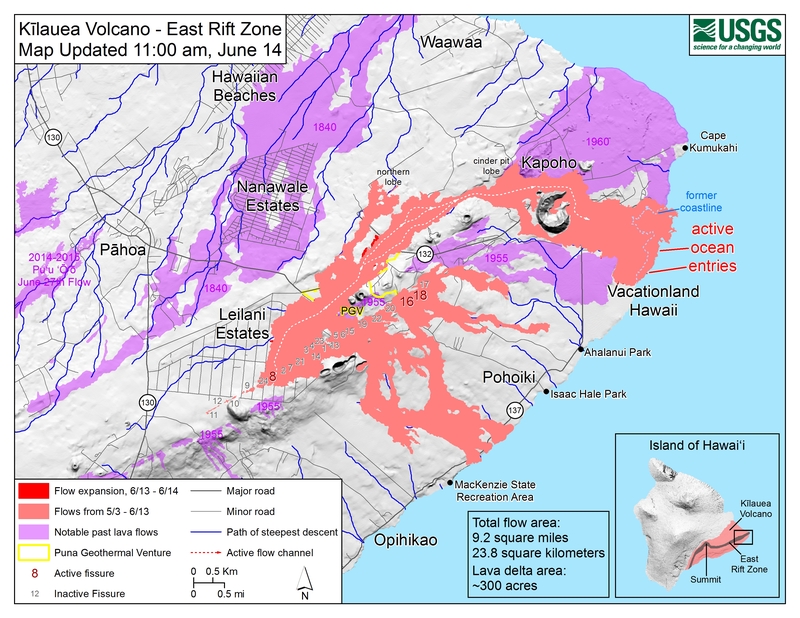 The U.S. Geological Survey released this map, photos and video of the East Rift Zone on Thursday, June 14, 2018. Map as of 11 a.m., Thursday, June 14, 2018. Given the dynamic nature of Kīlauea’s lower East Rift Zone eruption, with changing vent locations, fissures starting and stopping, and varying rates of lava effusion, map details shown here are accurate as of the date/time noted. 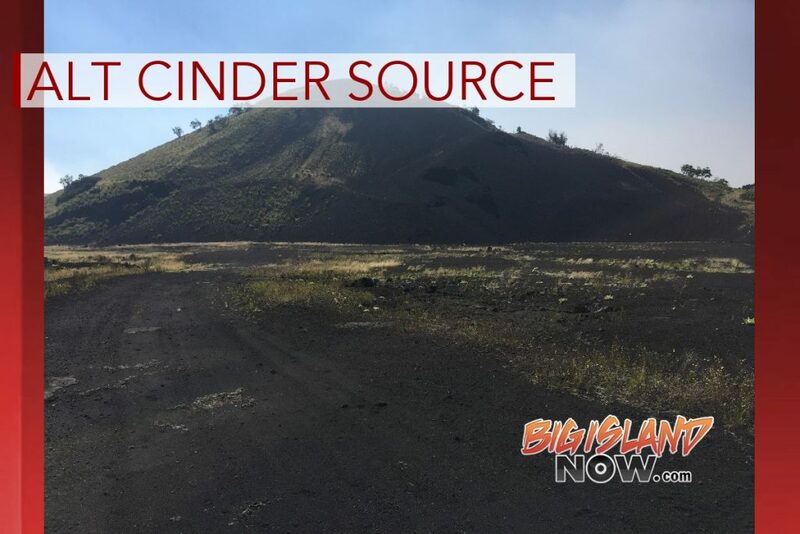 The Fissure 8 viewed from the north at 7:50 a.m The cone is roughly 165 feet high at is peak, and a plume of sulfur dioxide and other volcanic gases rises as an orange tinge from the erupting lava fountains (hidden within the cone). To the left of the cone, a standing wave of lava can be seen in the channel. Click to enlarge. 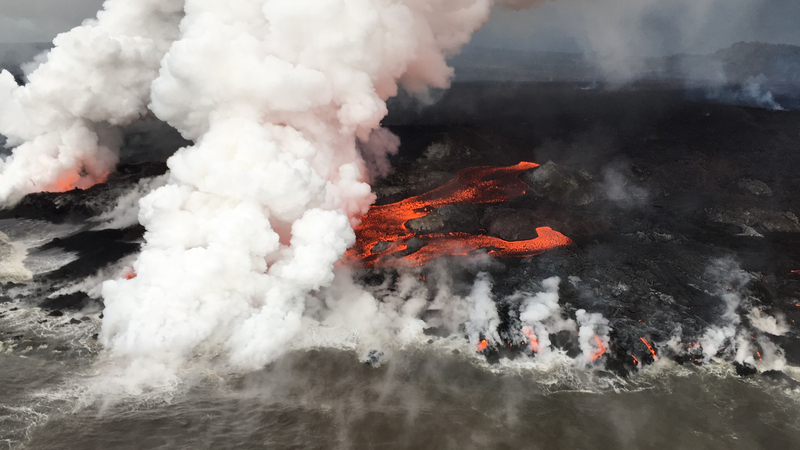 Lava is still flowing out of the vent unabated as a full channel and the ocean entry is active along the length of the flow front. Several laze plumes rise along the ocean entry margin as break outs feed many small and large flows. The largest Pāhoehoe breakout area is on the northern margin of the flow (furthest plume in this image). A close up view of the pāhoehoe breakouts along the northern ocean entry. USGS Photo. Click to enlarge. 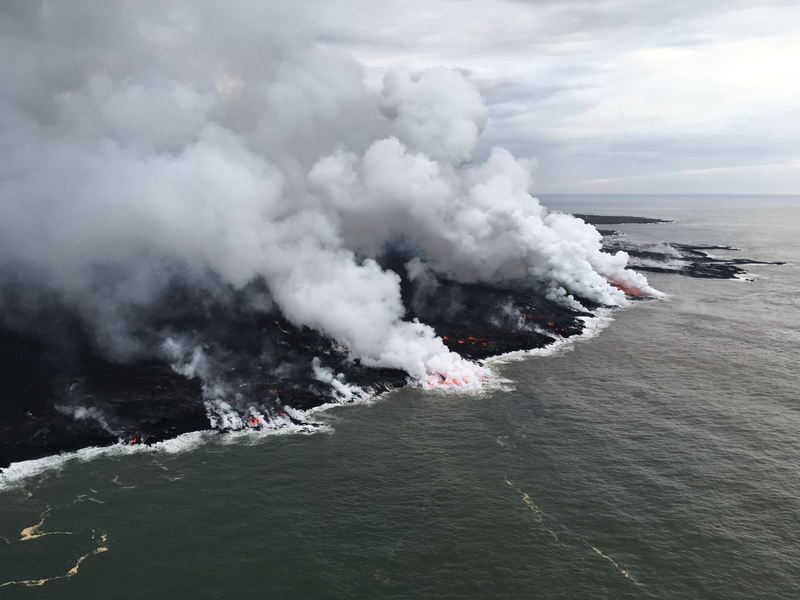 A helicopter overflight video of the lower East Rift Zone on June 14, 2018, around 6 a.m, shows lava fountaining at fissure 8 feeding channelized lava flows that flow into the ocean. 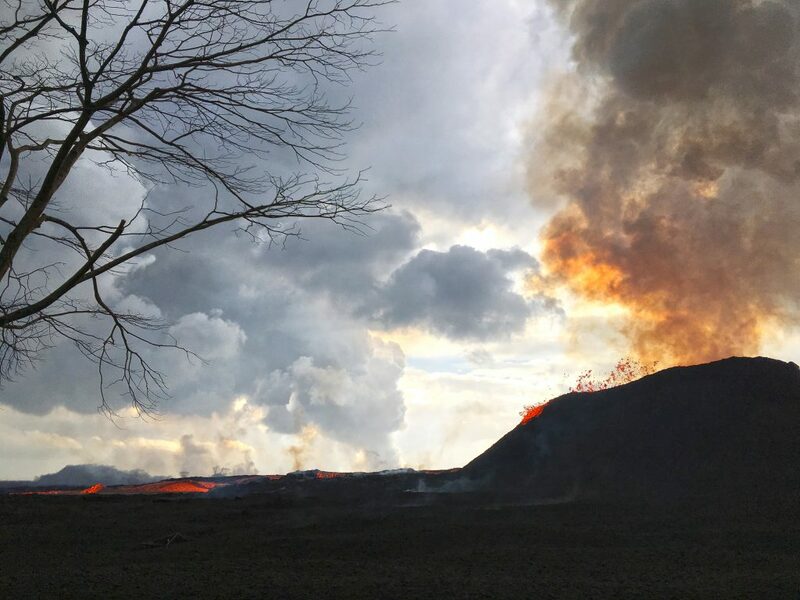 Lava is still flowing out of fissure 8 unabated and the channel is full. At the start of the video, standing waves in the lava channel can be seen near the vent exit. The channel appears crust-free from vent to the bend around Kapoho Crater. A surface crust forms over the channel as it spreads out during its approach to the ocean. The overflight along the ocean entry is from north to south along the coastline. The ocean entry is active along the whole length – approximately one mile. Small litoral explosions are occurring and there are several plumes of laze.